It's always scary when a good independent band signs to a major label. Is the band going to bend to the wishes of the record label executives and compromise their sound? Is the band going to be marketed in such a way that you get tired of seeing their videos on Mtv and hearing their songs on the radio? In this case, I think fans of Death Cab for Cutie don't have to worry. While the band did sign to a major label, they've still released a good, solid album that's true to their principles. That's not to say, however, that this is their best album. It's a great record, but it just doesn't qutie match the greatness of its predecessor, 2003's critically acclaimed Transatlanticism. Where that album was full of strong tracks and catchy melodies, this album is full of strong (but not quite as strong) tracks, and catchy (but not quite as catchy) melodies. The album lacks a "Title & Registration" or "Title Track". 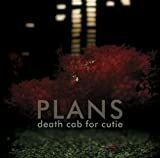 But on the whole, Plans is a great album. "Soul Meets Body" and "Someday You Will be Loved" are my favorites on the record. So if you're gotten through my incoherrent rambling and you're still reading, I guess all I have to say about this album is that it's good. It's not Transatlanticism, but it's still way to excellent for any psuedo-hipsters to call Gibbard and Co. sell-outs.